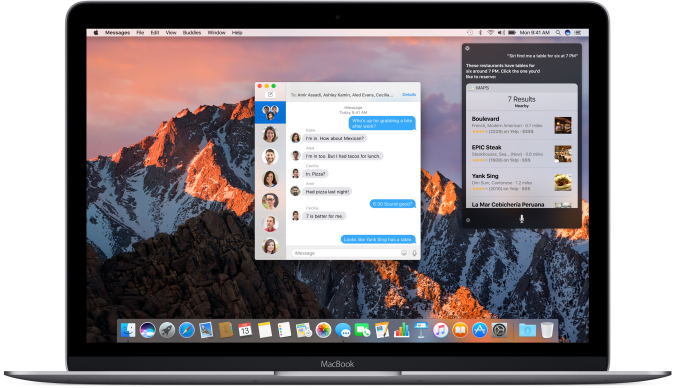 macOS Sierra was announced at this year's WWDC, and by this point it's now on its second beta release for developers. Today Apple is making a beta version of Sierra available to the general public as part of the Apple Beta Software program that technically began with the original Mac OS X 10.0 beta, but more recently began again with the later releases of OS X Mavericks. The macOS betas allow Apple to bring a wider range of users into the development and testing process which helps with discovering bugs and getting feedback about the implementation of new features. The macOS Sierra beta will be available for anyone with a supported Mac to download from Apple's beta software site later today. As always, Apple notes that the OS is still in development and so bugs and other such issues may be encountered with existing applications as well as updated applications and features that have been added to the OS. Users also also encouraged to provide feedback via the built in Feedback Assistant app. Updates will be provided through the Mac App Store as usual, and when the final version of macOS Sierra launches there will be a direct update to it as well. Some of the past system cutoffs were easy enough to figure out - 32 bit GPUs gone, 32 bit UEFIs gone, but these are sometimes weird. I.e what does a 2009 Macbook do better than a 2009 Mac Pro? Wish they gave some reasoning for each cutoff. Windows 10 still works nicely on a Core Duo (not even 2, remember Yonah?) laptop we have kicking around, and it ran on an Athlon XP desktop before I scrapped that. They did require a 64 bit capable UEFI and processor earlier, but Macs can still run 64 bit programs even if the OS boots in 32 bit mode. An ability Windows lacks. However, just like Windows, if you're going to use the 64 bit version of the kernel, you need everything to have 64 bit drivers. Nope, the everything 64 bit transition was several versions ago (started with 10.7, and finished with 10.8).